Voxx: The World's Most Accurate Psychic ® | Total Lunar Eclipse in Pisces Tonight! Total Lunar Eclipse in Pisces Tonight! Tonight’s eclipse will prove to be one of the most special in a long time. We’ll be seeing the longest total eclipse to happen in many years. As far as Magick goes … may I suggest leaving any Magickal Rituals tonight to the more seasoned practitioners! Performing complex or unfocused Magick during such a powerful lunar phase can have unwarranted results, so be careful and plan your ritual in detail. This is a particularly potent Full Moon as well, as Pisces rules the 12th House of the Zodiac, and is highly Karmic in nature. 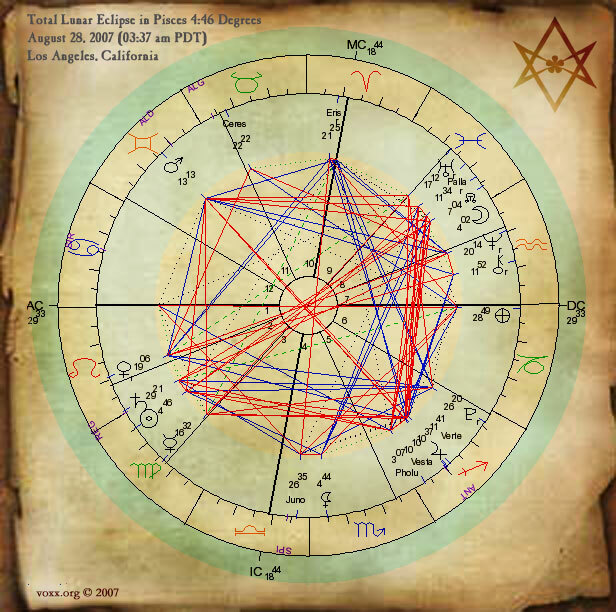 Astrological Chart for the Total Eclipse in Pisces. 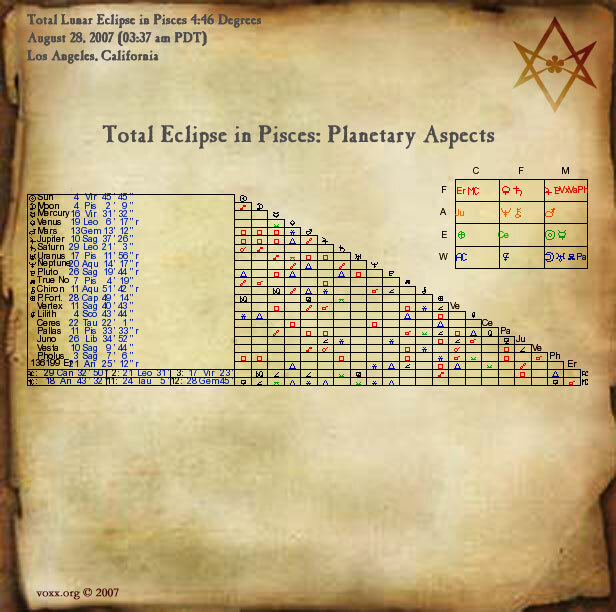 Astrological Chart for the Planetary Aspects of the Total Eclipse in Pisces. Get details for all Time Zones here! I’ll be adding more info and links soon! Check back. That was AMAZING last night! Thank you for the reminder, Voxx. Love always, Ani.